You can send claims that were created previously but not submitted to insurance carriers. On the Unsent Claims page, select the check box of the claims that are ready to be sent. Claims displayed in the color green have a Ready status (all required information is present on the claim). Important: Fix the problems for claims with a yellow Warning status (information is missing from the claim but might not be required) and/or a red Needs Attention status (required information is missing from the claim) before attempting to submit the corresponding claims. To view and edit claim details, click (or tap) a claim. Click (or tap) Send Selected Claims. On a patient's Insurance Claims page, click (or tap) a claim with a status of Unsent. 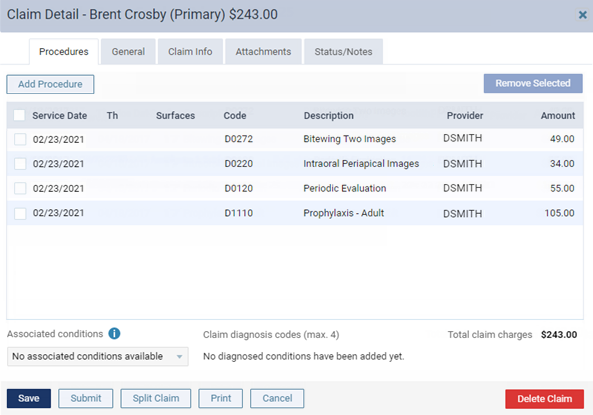 On a patient's Ledger page, click (or tap) a claim with a status of Unsent. Claim: Line 58 Additional provider.